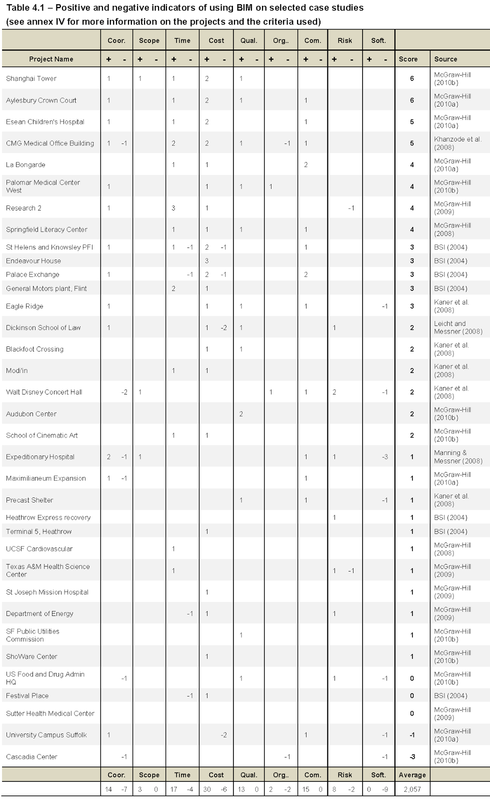 An exhaustive research was done to find the 35 case studies that served us as a basis to analyze the influence of BIM in real life construction projects. Several case studies were collected from existing literature to analyze in which areas the application of BIM had improved aspects of the projects studied. The use of BIM helped clarify project Scope to some or all stakeholders involved in at least 3 of the case studies. The amount of positive mentions of the implementation of BIM on negative risk reduction or control reached 8, with 17.14% of the projects having more positive mentions than negative ones (Table 4.2). Table 4.2 shows Quality as another KPI were only positive effects were perceived. Coordination (or Integration) Improvement was mentioned 14 times. 12 of the projects had more positive than negative mentions on Coordination due to the implementation of BIM. The effects of BIM on communication found in all of the 35 case studies were always positive. The second KPI with higher positive effect results of using BIM is “Time reduction or Control”. The effect of using BIM showed a positive effect on 34% of the projects (12 out of 35). The results show clearly that the “Cost Reduction or Control” is the KPI that more often was seen as receiving a positive effect of using BIM. It is important to highlight here that the approach taken to quantify the number of projects in which a KPI had positive effects was conservative in nature. Following the methodology explained in the previous chapter, primary and secondary data needed for the research was gathered. This chapter will show the results and findings derived from the collection of secondary data. Questionnaires were used to gather primary data. The type of primary data necessary for this research was both of quantitative and qualitative matter. We have already seen in previous chapters the potential benefits that BIM can bring to projects, and as a consequence, to Project Manager’s workflow. This section explains the gathering of data that proves that this potential benefits are actually materialising when BIM is being applied to real world projects. Because of the resources and time frame available for this dissertation, it was impossible to get those results from primary data. For this reason the author chose to get the needed data from secondary sources which are easily available on the internet. The topic of BIM has already been studied by many scholars (Aouad et. Al., 2006; Manaula, 2008; Succar, 2009; Lee, 2008); by professional groups (BSI, 2010; McGraw-Hill, 2008, 2009, 2010a and 2010b); and of course, by software vendors (Autodesk, 2007; Bentley, 2003). Of all of the above mentioned references and many others, the studies by McGraw-Hill provide a greater amount of data about the status of BIM in North America (McGraw-Hill, 2008) and in Europe (McGraw-Hill, 2010a). The latter study has its focus on UK, France and Germany. Unfortunately, no data about the status of BIM in Spain has been found, so any specific reference to this country on this research will rely for on the primary data gathered from the questionnaires that will be further explained on the following section. Additionally to these two studies, several case studies mentioned in other papers where compiled and the data of these case studies was organized to get an overall picture of what are the real benefits that BIM is actually providing to practitioners. This data was later on compared with the a priori stated benefits of BIM (Figure 2.2 and Table 2.1) to analyze how accurate these potential benefits are and in which areas BIM is not yet being used or perceived as a useful tool. The benefits extracted from the case studies were translated into the Project Management KPI compiled in Table 3.1, to be able to quantify which KPIs benefited the most from the implementation of BIM. All data obtained from the above mentioned secondary sources is organized and explained in Chapter 4 of this research. Links and relationships between the information gather from secondary and primary sources will be also drawn. The gathering of primary data is explained in the following section. The necessary data was gathered in the following way. A combination of qualitative and quantitative data was gathered.n Primary data was gathered from questionnaires and secondary data was collected from available sources. The data was analysed to test the starting research hypothesis as part of the deductive approach, then the observations from primary data were used to formulate a theory on “How BIM can help PMs” and to propose further research topics relevant to this dissertation. The results of both the collection of primary and secondary data are explained on the Results and Findings chapter of this dissertation. The second part of the research question “How can BIM help Project Managers succeed in delivering complex construction projects" required a complete different approach. In this case an inductive approach was more adequate, because we were trying to come with a theory from a series of observations and from own experience. For this part, it was important to find out what were the expectations of AEC practitioners and their readiness to commit to a new technology and new processes. The opinion of construction professionals on how BIM can help AEC professionals to better deliver complex projects was also necessary. Questionnaires (Annex I and II) were designed to gather data regarding the perception of construction professionals of BIM. These questionnaires, later explained in more detail, were the base to come up with the list of ways in which BIM can help the delivery of complex construction projects. For this part of the research both the primary data gathered from this questionnaires and the secondary data gathered from several sources were the corner stone that would allow the author to come up with a theory of how BIM can help Project Managers. At the same time, all this primary and secondary data was used to fulfil the 4 research objectives, which are here listed again. 3. To define which role should the Project Manager assume within the BIM framework. 4. To analyze the existing challenges for BIM implementation and estimate future developments that might mitigate these challenges. The research methodology begins with a deductive approach. Our initial goal was to test the hypothesis that BIM is an adequate Project Management Tool.Our first step on the process of deduction, as explained in Lancaster (2005), was to formulate the above mentioned hypothesis. There was the initial assumption that BIM is a tool for Project Management. The answer to the question “Is BIM a Project Management Tool?” was assumed to be affirmative. Nevertheless, the assumption was tested for confirmation. To do so, on Step 2 (Figure 3.1) some Key Performance Indicators [KPI] for project management were defined and on Step 3 the information was compared to these KPI to assess the relevance of BIM for PM practitioners. The information was gathered from secondary sources. These sources are detailed later on during Chapter 4 of this dissertation (Table 4.1). Secondary data from completed construction projects that implemented BIM was gathered to analyze in which ways the projects benefited from the use of BIM. 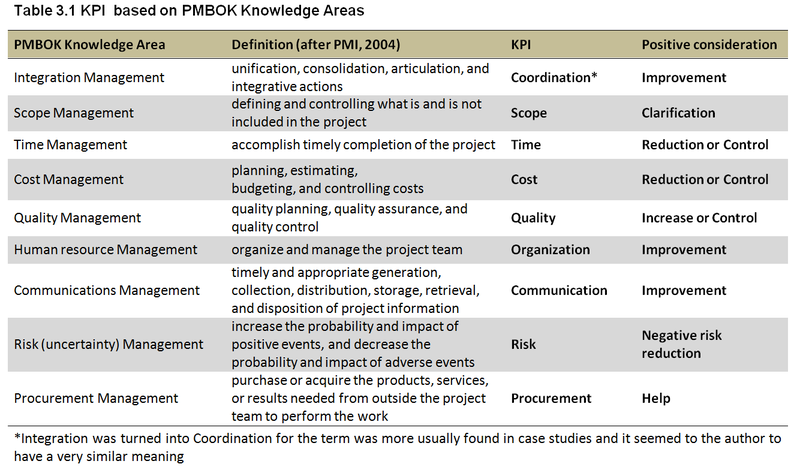 The role and influence of BIM in these construction projects was compared with the role and influence expected from a Project Manager using the KPI that were defined (Table 3.1) based on the analysis of the role of the Project Manager from the PMBOK (PMI, 2004). Although each of the PMBOK Knowledge Areas includes a lot of different aspects, they were simplified using the main topic the author considered they dealt with. This might seem as an excessive simplification, but the creation of these KPIs was essential for the deductive part of the dissertation, and the translation from a complex set of variables to easy to understand KPIs was also needed. 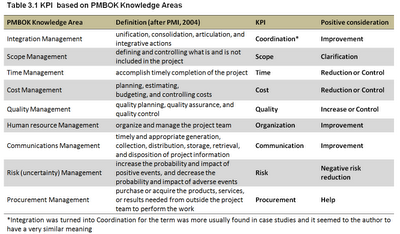 The Coordination KPI was created from the Integration Management PMBOK Knowledge Area. The change in name from Integration to coordination is worth explaining. The change in nomenclature from Integration to Coordination (Table 3.1) was done after reading most of the Case Studies and finding that coordination was mentioned much more than the word integration. Analyzing the content of the Integration Management chapter of the PMBOK, coordination was seen to embrace most of its meaning like “Identifying that a change needs to occur or has occurred” or “Reviewing and approving requested changes“ (PMBOK, 2004 : p.96). It is common practice on deductive research approaches to use an extra step to the process shown on Figure 3.1 (Lancaster, 2005). This extra step is usually called falsification or discarding theory, and it is based on the premise that the researcher should aim to refute his own theory rather than to prove it (Ibid.). In this case, and despite the unorthodoxy of the chosen approach, this last step will focus on the aspects that prove the theory and not so much on those that refute it. This approach was chosen because the deductive part of our research is just a starting point for the more relevant aspect of this dissertation, the formulation of a list of aspects in which BIM can help PMs to deliver complex construction projects.